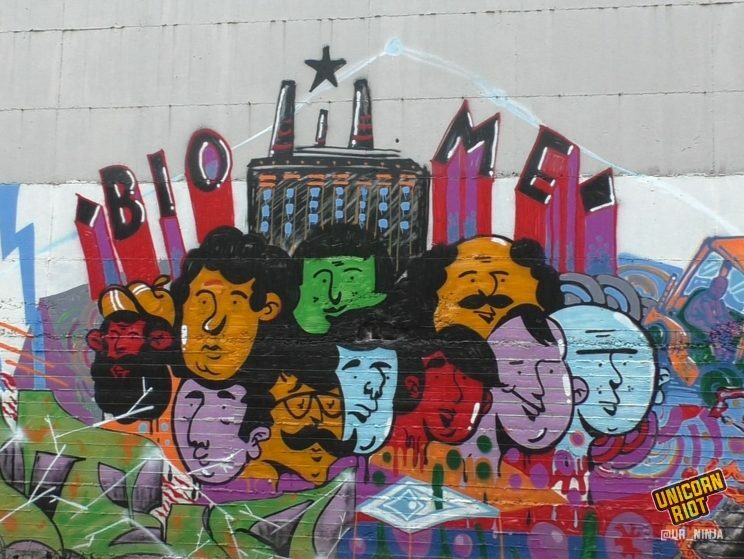 Occupy, Resist, Produce: Inside the Self-Managed Factory of Vio.Me. 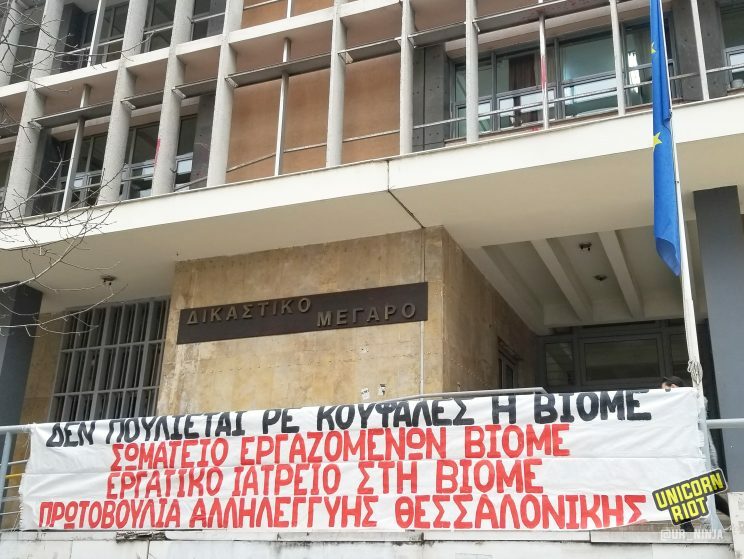 Thessaloniki, Greece – Workers have successfully self-managed the production of environmentally-friendly cleaning products for the last six years in the occupied factory Vio.Me. There are no bosses in this factory on the east side of Thessaloniki, Greece’s second largest city. Workers have been in full control since occupying the factory in 2013, two years after the workers had stopped receiving paychecks from the business due to the parent company having filed for bankruptcy. Unicorn Riot brings you inside the worker-run Vio.Me. facility in our three part video series. We spoke with five of the workers, took a tour of the factory, gained a deeper perspective and history of Vio.Me. 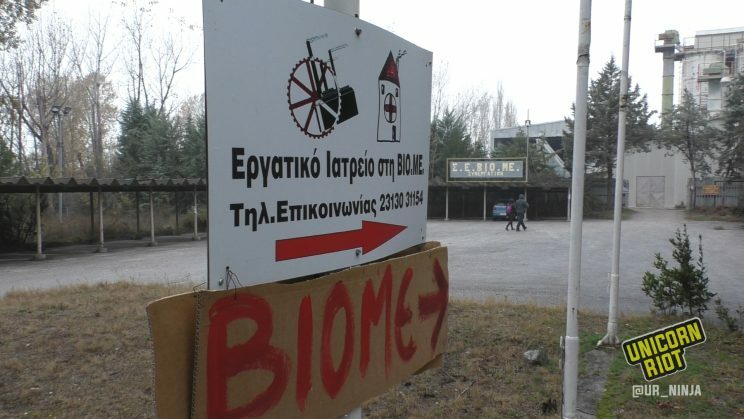 from the workers, and a had sit-down with Dimitra, a psychologist in Vio.Me.’s autonomous and open-to-the-public Workers Healthcare Center. Viomichaniki Metaleftiki (Vio.Me.) was originally established in 1982 to produce adhesives and other products. It was a subsidiary of the multinational company Filkeram-Johnson S.A. which was the first and largest ceramic tiles producer in Greece before it went bankrupt during the financial crisis of the 2000s and stopped paying its 350 workers in May 2011. After years of being owed money with few prospects of being paid by this employer, or of gaining similar employment elsewhere, the radical union inside Vio.Me. that had already been organizing inside the workplace, along with the Solidarity Initiative of Vio.Me., decided to occupy the factory and seize the means of production. The Solidarity Initiative of Vio.Me. 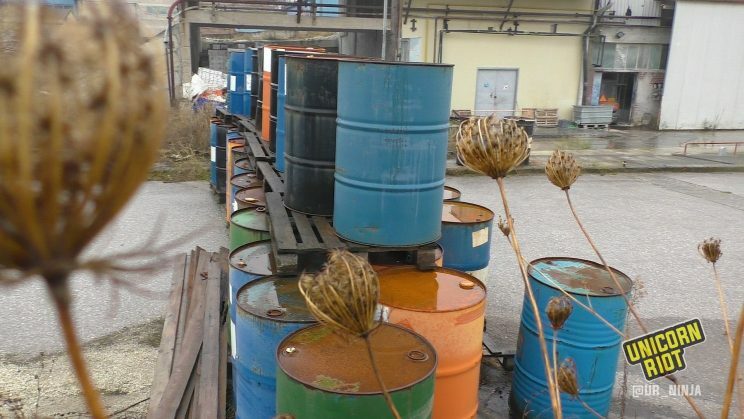 decided for the occupied factory to produce natural and ecological cleaning products and vegetable oil soaps. Production inside the factory started six months after the beginning of the Solidarity Initiative. Spiros, a worker inside Vio.Me. who was a member of the Solidarity Initiative during the beginning stages of the occupation, said that this was a “very important step in workers control.” It was the workers themselves who had brought the discussion to the Solidarity Initiative and “to go forward” with the decisions to not only occupy the factory but also of what to produce. Vangelis, a chemical engineer who specializes in research and development of new products said that the materials included in the products they produce are all natural and do no harm to the environment. 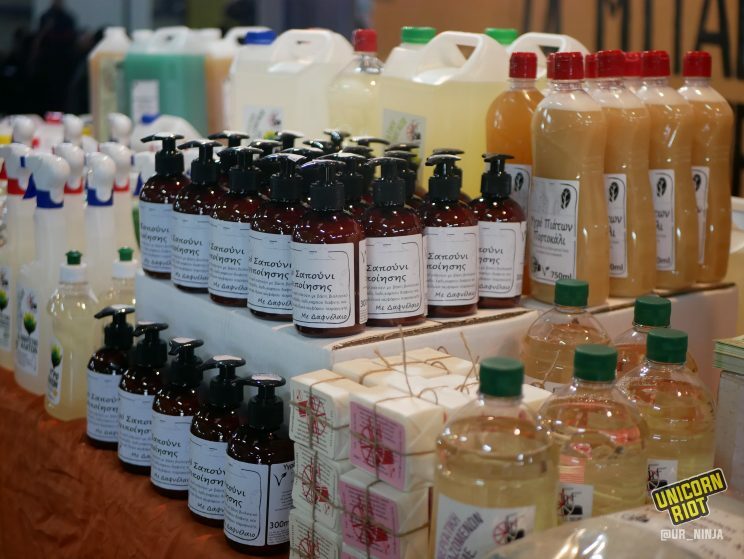 The use of eco-friendly products is important to the values of the workers and something they feel good about producing. From the production on the shop floor, to the sales, accounts, and marketing, to the conditions in which they all work, the workers have full control. They self-manage the factory and even rotate their workflow based on their own choices each day to take part in different aspects of the production. All of the major decisions inside Vio.Me. are made by consensus. This doesn’t come without problems though: “The main issue with that is not only voting or deciding about what you do, but also being responsible for doing what you have decided,” remarked Spiros. 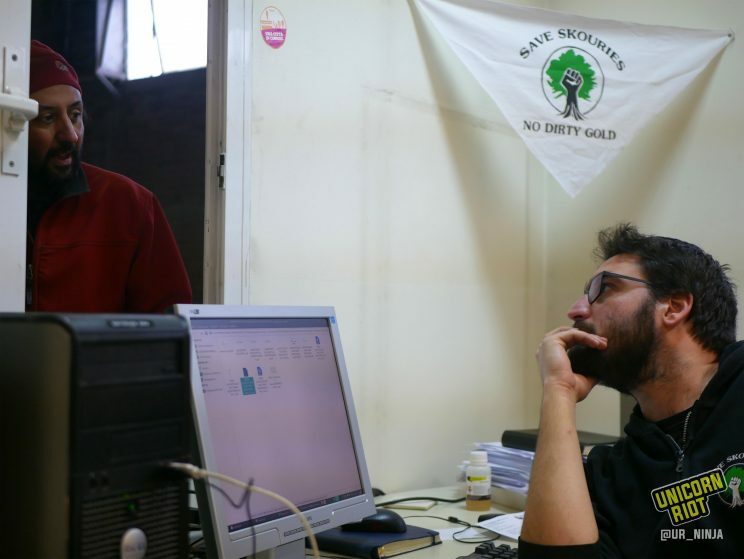 Makis, who has been working in the factory for over two decades and was one of the original members of the occupation, spoke highly of the honor that the workers felt by going to a job that they believed in. He told us that a “comrade once said, ‘this factory is a factory that mainly produces dignity’,” and explained that meant a lot to him. To get to this point of successfully running an occupied factory for over six years now has not been an easy task for the workers. They are also under an overarching threat of auction or a raid of the factory as they are not yet within legal standings. Because the bankrupt Filkeram company owes money to the state, private individuals, and its workers, state-run auctions of the field that Vio.Me. resides on have taken place since November 2015. Auction proceedings happen in a downtown courthouse in Thessaloniki, almost yearly. The cycle includes multiple tries at bids to sell the property, usually five, and in the past has gone one day per week for five weeks. The scene during each auction is similar: Riot police line the hallway to the particular floor of the court rooms of which the auction is held as Vio.Me. workers and community members standing in solidarity amass in the stairwell entryway and hallway. In the case there is a bid on the property, they will attempt to try to block it. There has been no bid yet, and after each auction, the price of the property goes down. Barrels form barricades, blocking a road leading to the Filkeram factory from worker-owned Vio.Me. Though there have been threats against the Vio.Me. cooperative, and despite the time and energy required by each worker for just a small amount of pay, the effort is worth it to those worker-owners with whom we spoke. Vangelis told us that he thinks “the workers from the base should equally manage every workplace“. Those we spoke with at Vio.Me. also pointed out how natural it is for workers to have control over their workplace. They described a strategy of self-organization starting from daily conversations each person has with their co-workers and others, to planning and taking small actions, to building of workers’ confidence to do more radical actions. The values of equality, self-management, self-organization, autonomy, and horizontal organizing are a part of the daily culture at Vio.Me. This culture also enriches the mutual support in the broader community, which predominantly sees the occupation in a positive light. The assemblies of the Solidarity Initiative further allows for an equal participation from all community members or members from other networks of solidarity and worker’s economy who want to be involved. A shining example of the solidarity from the workers to the community is the Workers Healthcare Center of Vio.Me., which was created by the workers, for the community. The Workers Healthcare Center is reclaiming equal relations between specialists and patients with a radical new approach to health services that are also focusing on the working conditions. The Healthcare Center has seen over 200 visits in the last three years by about ten specialists who have voluntarily provided holistic integrative health services free of charge to anyone who comes in from the broader community. See our full special on the Workers Healthcare Center. The occupied facility not only houses a radical healthcare center, but also numerous festivals, concerts, and other public events. The factory also became a transit spot for solidarity items and donations going to refugee camps during the height of the refugee crisis, when many thousands displaced from Syria and beyond were fleeing into Greece from western-led wars. These varied uses re-engage the work space into a radical community venue and a commons. Eclipsing six years of occupation, the workers of Vio.Me. are happy to come to work and to be able to provide themselves a living while producing eco-friendly cleaning products, all under full worker control. Vio.Me. has proven to be a tangible real-life solution to workers abandoned by a bankrupt factory and a corrosive economy. As the workers carve a pathway forward, they illuminate how an existence beyond the norms can come to fruition. Special thanks to the workers at Vio.Me. for the hospitality and welcoming. Thanks to Dina, Panagiotis Koustas, malcolm wells, Waterstyle, Sofia, Marcos Internacional, and Social Waste.